Long, lean, casually elegant even in a sweatshirt and jeans, it’s easier to envision Dr. Craig Russo, neuroradiologist with the Clinical Radiology Group, at a white table in a locale with palm trees than in the middle of a cold Midwestern winter. Yet he makes his home and music here. 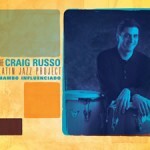 Russo is also the leader of the Craig Russo Latin Jazz Project, a group making music that fuses Latin and Afro-Caribbean music. When that music wanders out into the audience, whether the music is at a live performance or the “audience” is listening to a CD, the temperature rises, the air gets balmier and the dull colors of the Midwest slip back and allow the sun-drenched colors of the tropics to take center stage. Russo didn’t intend to end up in the Midwest; he started out here and envisioned himself somewhere else. But circumstances brought him back and, all in all, it has been good for him and his music. Russo grew up in Iowa. 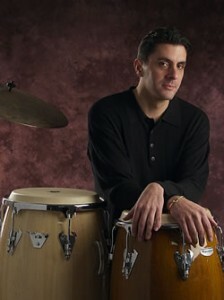 He is a percussionist and drum-set artist. At age 15, he and his family traveled to Puerto Rico for a visit. It was a life-changing experience. “I was blown away.” Russo went to a club one night and heard the music that would become his passion. He stayed too long and spent too much of his money. When he had to return to the hotel, he took a cab and watched with growing concern as the cab’s meter kept turning – closer and closer to the end of his money. Finally, without speaking Spanish, he had to tap the cab driver on the shoulder and tell him to let him out and please direct him to the hotel so he could continue there on foot. The cabbie was kind and took him all the way to the hotel. After that, he got some conga drums and began to work with them. 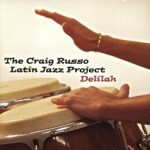 Russo’s undergraduate work was at the University of Iowa, where he began school on a full-ride scholarship in music. By his sophomore year, he had doubts. He looked at what other music majors were doing. He wanted to have a family life, to be home at night, to have an average income, to play the kind of music he wanted to play. Russo began looking at other options. He changed to psychology and played on weekends. When he graduated, he knew he wanted to go to medical school. He was an outstanding student and had a number of opportunities including Harvard University. He chose Albert Einstein College of Medicine in the Bronx in New York. The majority of the student body was Jewish, 15 percent of it Orthodox. As an Italian kid from the Midwest, they cherished him as part of their diversity. His first encounter with the school showed the dramatic cultural shift. He was accepted. He chose the school, in part, because it was in New York. It was emotionally and intellectually challenging, and the long hours were physically demanding. He studied and kept up with his music. “All of my entertainment budget was committed to going out and listening to music,” he says. “When people came to visit and asked me where a good restaurant was,” he says with a smile, “I couldn’t tell them. I could tell them where to get good music or a slice of pizza, though.” His study break was listening to the jazz radio station in his apartment. At one point, he thought about going into clinical psychopathology. But after being close to it, he knew he couldn’t do it for too long. After Albert Einstein, his residency in diagnostic radiology took him to SUNY Health Science Center at Syracuse, N.Y. His fellowship in neuroradiology was at Medical College of Virginia Hospitals in Richmond, Va. When he completed his fellowship, although he was very well qualified to enter into any radiology practice, he was looking for a job at a time when the need for radiologists and the supply was out of whack, and the specter of managed care had medical practices kind of frozen. In this climate, he saw an ad for a neuroradiologist on Lake Shore in Illinois. It was Lake Shore in Decatur, but since he didn’t know Illinois, he assumed Decatur might be a suburb of Chicago. When he found out where it was, he said thanks but no thanks. They pursued, and he finally agreed to talk. They made him an offer he couldn’t refuse, and Russo returned to the Midwest. When a position opened up at Clinical Radiology in Springfield, they offered and he made the move. He’s been happy. “Clinical Radiologists is the largest group in Illinois. We have a national reputation – it’s off the charts in every way: quality of work, leadership, we’re very adaptive in the ways that medicine has evolved,” he says. Asked if he would go into music full time if he could, Russo doesn’t hesitate for long. “The reality is, unless you’re a famous performance artist, there are not that many opportunities to play,” he says. Part of the problem is people just don’t go out to hear live music as much as they used to. Russo sees it as a cultural shift. “It began with disco. When people went to hear music, they wanted to dance. They wanted to dance to what they were used to hearing, and they wanted to do it over and over. Now there are computers, downloads,” he says. “Dec. 3, we are playing the Jazz Showcase in Chicago, one of the most prestigious jazz opportunities in the world. It has been closed for a year because they lost their lease. It took a year to find another place. It’s prestigious, but do you know what the musicians make? Probably $100,” he says. Russo says he gets to play as much as he does, and he creates opportunities for others to play, because he brings two strengths to the table. “First, being in medicine, I probably have better organizational skills than average. Second, I don’t have to rely on the money. I don’t really care what I earn. Most leaders earn a leader fee. I probably take a leader cut. I would rather make less money and have five people in the group than make more money and just have four people in the group,” he says. But while Russo brings financial stability and organizational skills to the table, they only count if he can deliver the music. When he began recording, he listened to the music and realized he wasn’t as good as the guys he was listening to. So he worked at it. He has traveled to Cuba about five times – legally. He emphasizes that. Eight years ago he learned Spanish to help with understanding the music and culture. 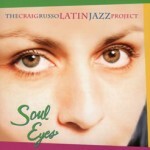 Today, the Craig Russo Latin Jazz Project is making a name for itself and getting to play in the places some musicians only dream of. Two years ago, the group played the Saint Louis Jazz & Heritage Festival on the main stage, the only regional group to play the main stage. In December, they played the Jazz Showcase. 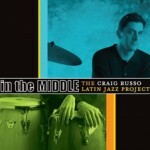 Their latest CD, “In the Middle” is getting national and international play, and it’s been reviewed by national press. He had to hire a radio promotion person to handle the extra exposure. It’s creating more opportunities for the group to play. All in all, Russo says to his surprise, being in the Midwest has worked out well. In San Francisco, for example, the pool of talent would be bigger. “I couldn’t do what I’m doing in a lot of places because there are so many talented people. I have people who say they would play for free just to play that music instead of the weddings and the bar mitzvahs,” he says. Bottom line: Russo says the money he makes gives him the opportunity to be a purist, not a dilettante. “I use the money to create opportunities,” he says.